After yesterday’s very flat, for me, card, I wanted a little more dimension and some more layers for this one. 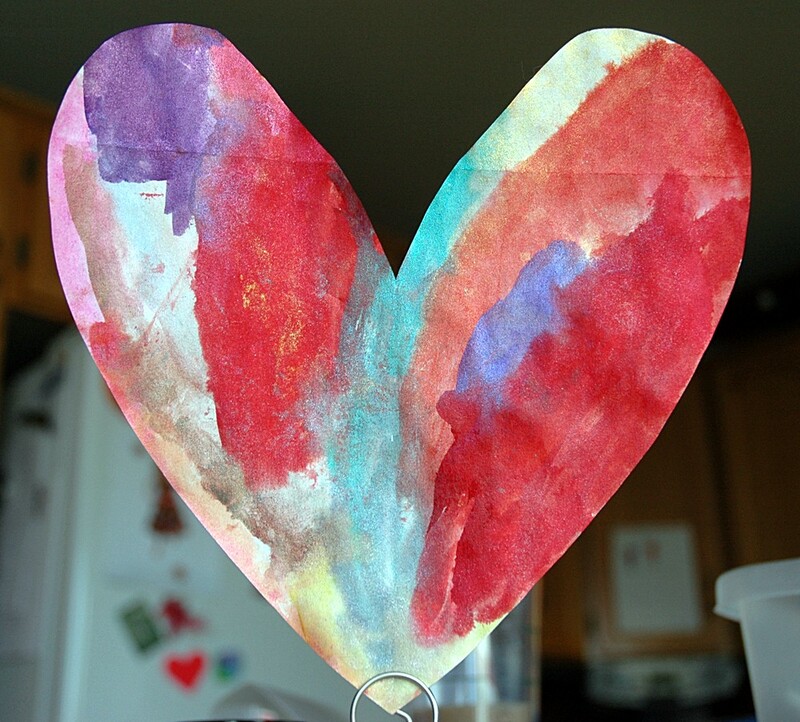 Before I start, a question for you – what do you do with the dried up paint on your craft sheet? Here’s what I did! 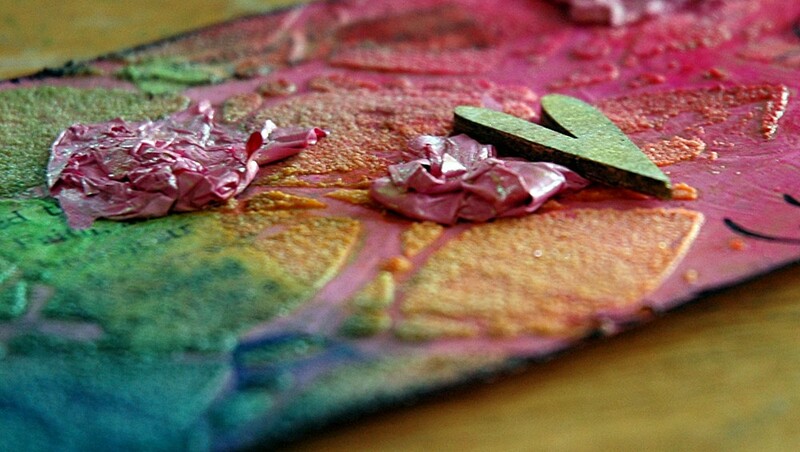 That’s right, my friends, I made little dried up paint blobs and used them as embellishments – nothing is garbage anymore, I’m afraid! I painted the background of this card with the leftover tinted gesso from yesterday’s card and let it dry. 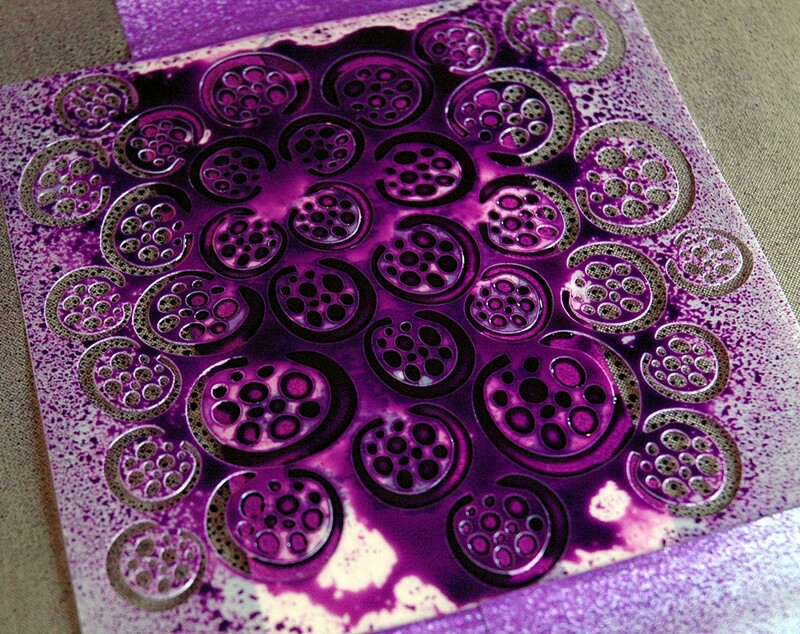 Then I used another new stencil, the Pointy Circles, and smeared Coarse Texture Gel over a portion of it. I was busy so I waited for it to dry, shocking, but true! Once it was ready to go, I misted my Dylusions over portions and blotted the excess. I kept layering like that until I had the shades and blends I wanted. 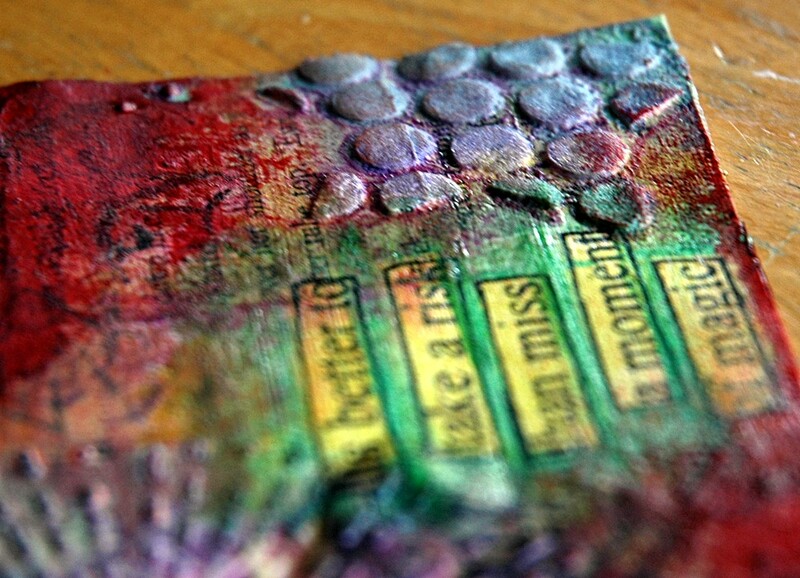 I then added vintage book paper, smeared mist over that, added the paint blobs (which I love! 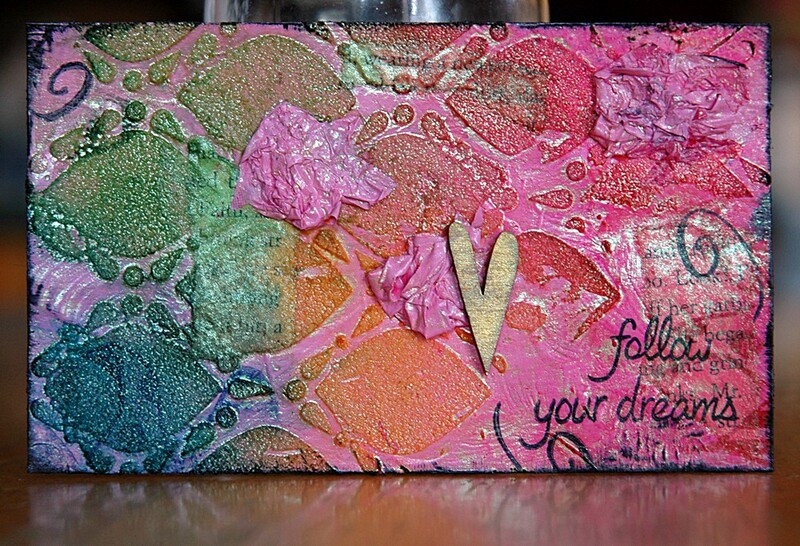 ), and a leftover heart from a previous card, then misted the whole thing with Kiwi Perfect Pearls Mist. 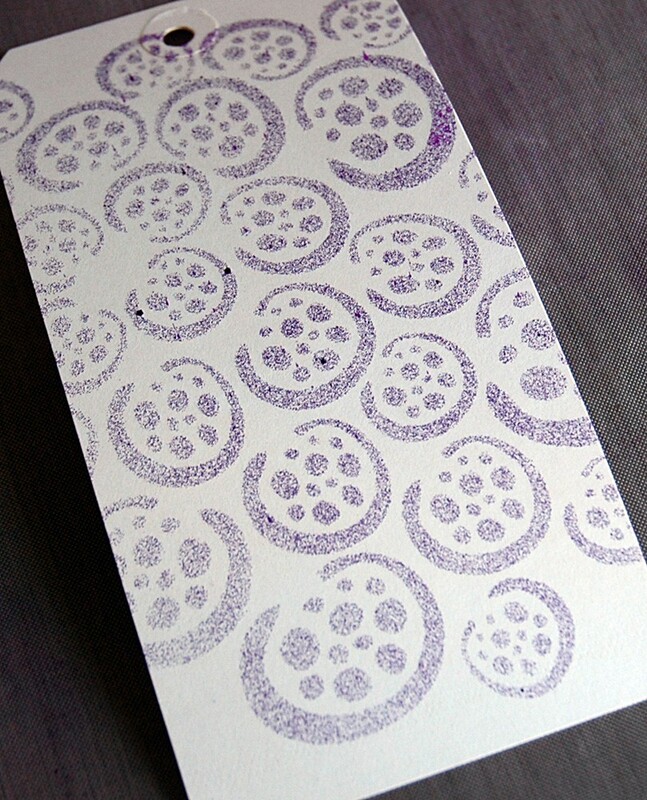 I finished it off with a stamp from Lawn Fawn, one of my favourites. D is picking up the new seasonal Distress Inks for me this evening so you can bet they’ll be on today’s card, which I’ll post for you here tomorrow! I can’t wait to get my fingers on those fabulous colours! 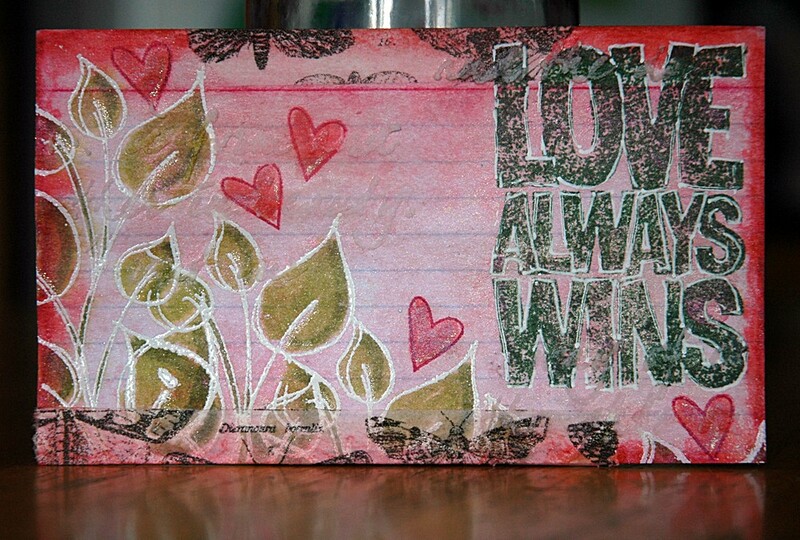 For this one, I mixed some red paint with my gesso and spread it over a stencil. 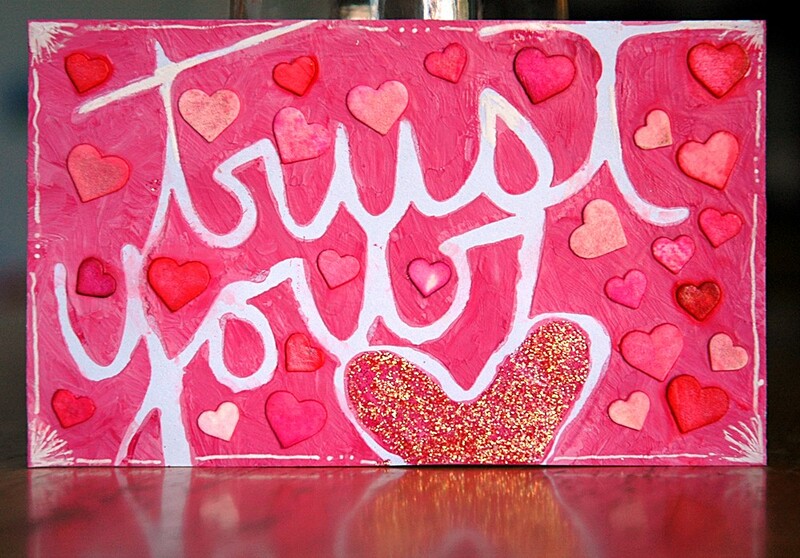 Once it dried, I doodled the corners and edges with my white gel pen and filled in the heart with Fruit Punch Stickles. While waiting for the glitter to set, I punched a bunch of hearts, misted them with red and pink, then soaked them with Perfect Pearls Mist. I used Matte Glue n’ Seal to attach them once the card was dry. And that’s it. 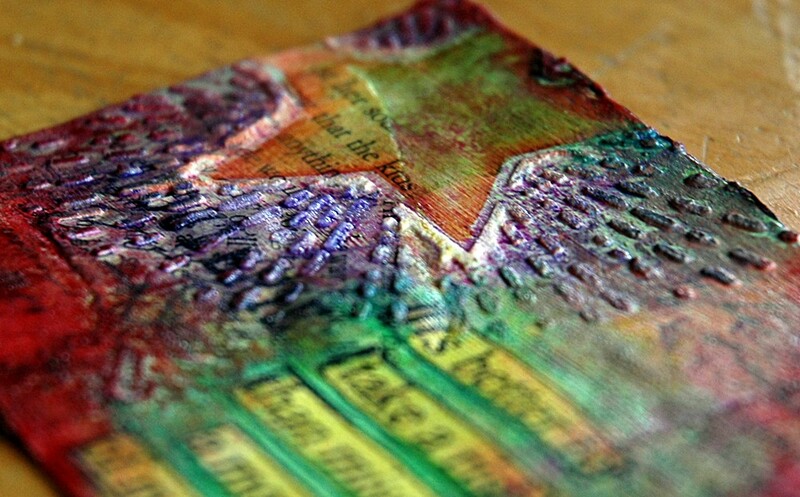 Some good bling happening, very tone on tone, but next to no layers – I’ll have to remedy that for today’s card! Me: M, come over and let me clean you up. M: Just a minute, Mama, I’m busy. M: Stuffing my hair in my ear. 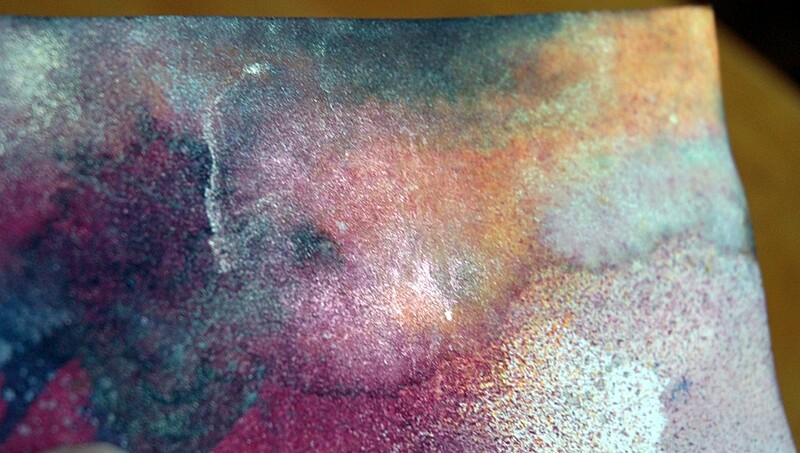 We’ve done dry media (ink), wet media (paint), and so today we’ll do fluid media (mist). As I mentioned in my first Stencil post, the drier the medium, the better the results if you want precise images. 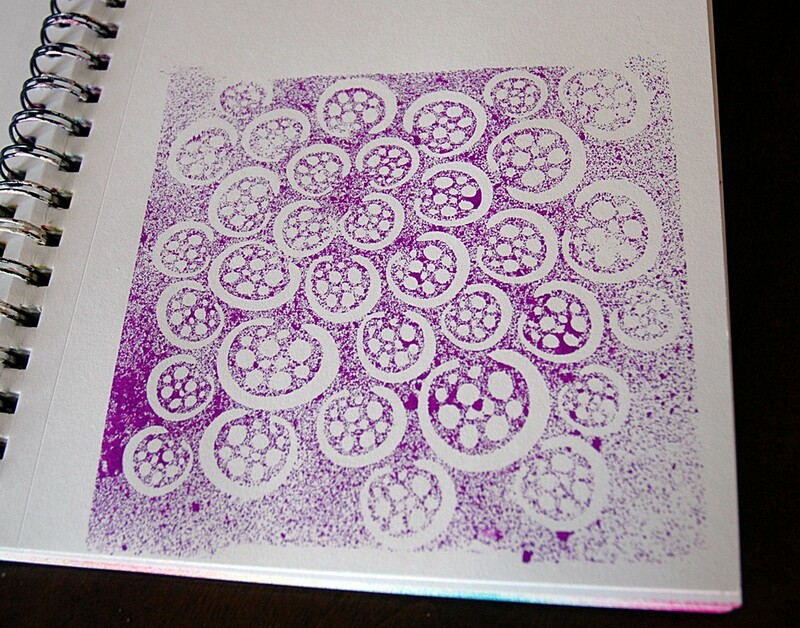 However, I also said that wet mediums can be used dry, like stippling with paint, for example. The same goes for mist, which is fluid. Now, to be honest, no one will ever mist that heavily and, chances are, they would roll paper towels over it first to soak up some of the excess before removing the stencil so it wouldn’t be this messy. I just wanted you to see how fluid the mist really is. Kind of a fun, arty look – not perfect but still quite defined. Or you can go easy! Now I’ve been told that’s easier said than done so here are my tips and tricks to get a perfect misted stencil image every time. Keep in mind, it’s not wrong to mist your heart out if that’s they look you’re going for! If it’s not, read on! First, do not, I repeat, do not press all gentle and nice on the mister. That will guarantee you splotches and puddles of ink. Not what we’re going for here! Just press down my friends, give it a good push and commit to the spray! I know I’ve mentioned this before…. Second, stand back; you don’t need to be on top of your project. Mist has a mind of it’s own and although you can say, “I want it round about there,” that’s as precise as it gets. It’s liquid and you’re spraying it, you have to be content with drifters. That being said, masking can beat the pants off fly away mist! See? No mist will go where I don’t want it to be (like the top and bottom of the tag)! Hold your mister about 12″ away and go for it. Don’t do it too much, two maybe three sprays are plenty, we’re trying to stay dry, remember? Carefully lift a corner of your mask and check, chances are you’re good to go – more ink comes down than you think. This was two sprays, loads of colours and a few puddles – that’s why you don’t want too much. 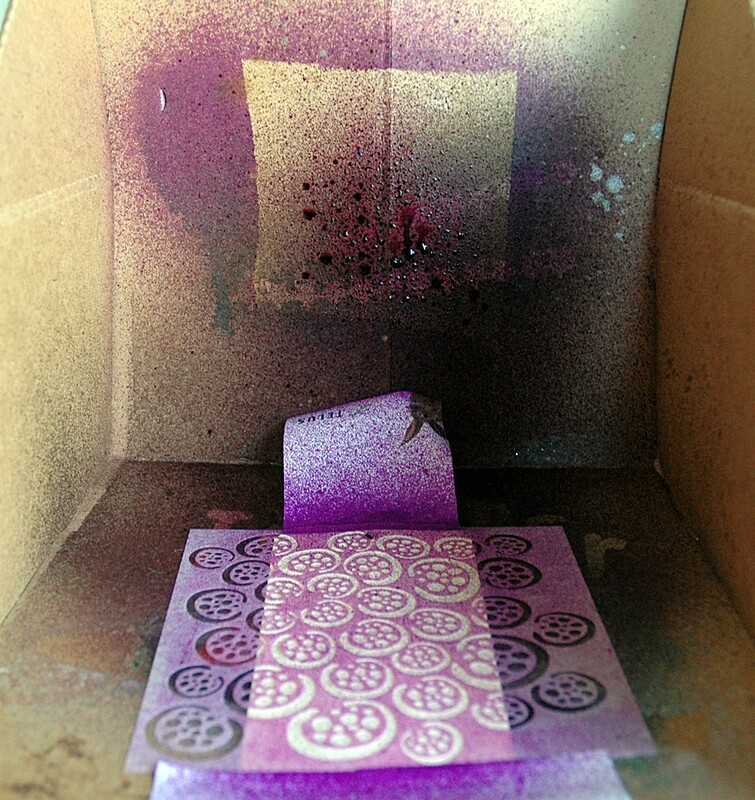 Set your paper inside, lay down your stencil, mask if needed, then aim your nozzle at the back of the box and go! 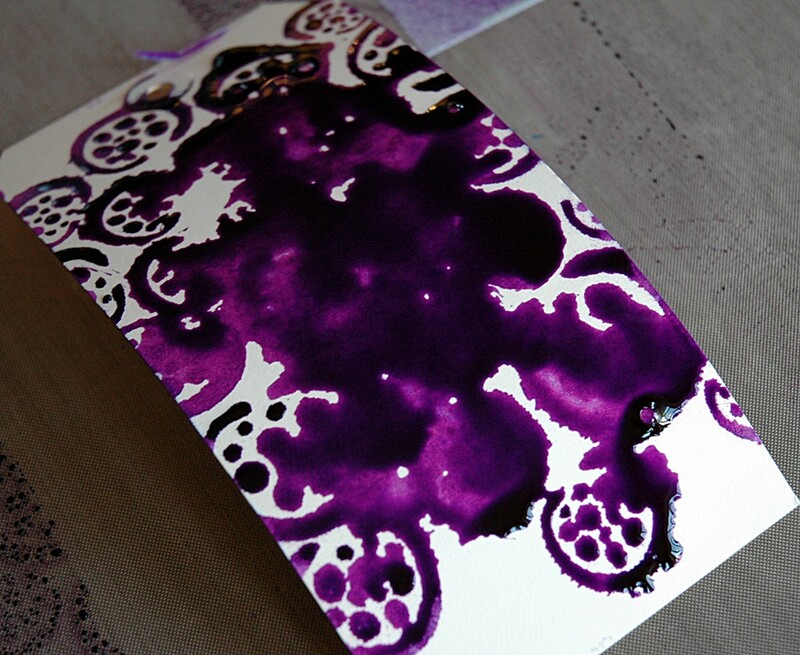 Lots of ink will drift down over your project and give you a great image. This is fabulous with white mist on black paper – perfect snowy night! Because this is an indirect method, it’s also the driest, but may require a few extra sprays. Always lift a corner and check, then mist again if you want. See – a lot cleaner but the colour isn’t as intense. 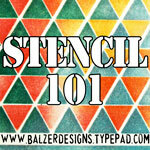 One more thing – don’t waste all that mist on your stencil! 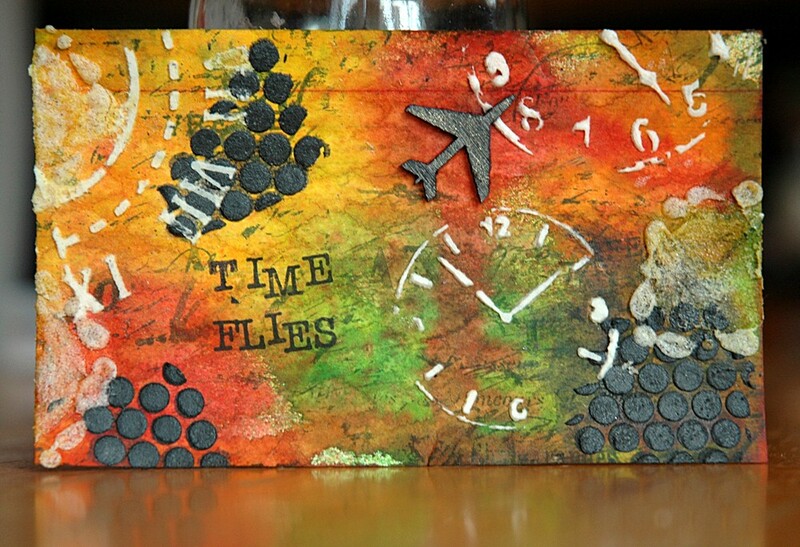 Flip it over and press it onto another tag, or in an art journal, or on a 12×12 piece of cardstock for a LO background. Just use it! You get the negative – sweet, huh? I misted three colours heavily (though not as heavily as the first example) and blotted the stencil before removing. I wanted a defined but not perfect image and it worked! I hope this makes you want to go play with mist a little – remember to leave me a link in the comments so I can check out your work when you give this a spin! This card actually started at crop night Friday night and was finished yesterday morning. 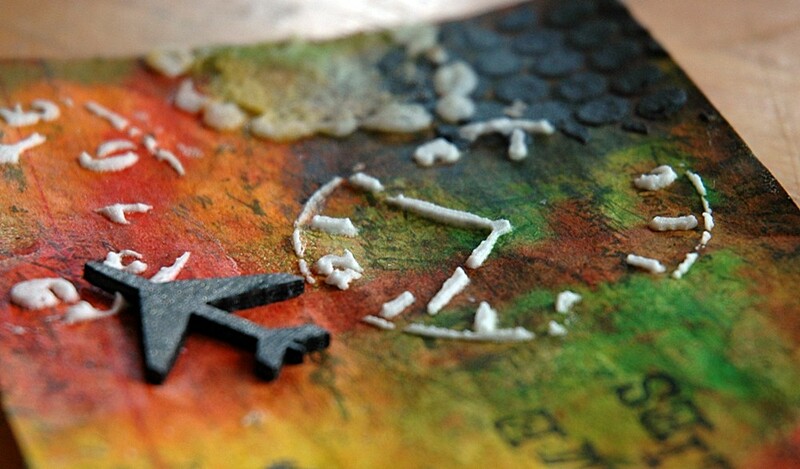 At the crop, one friend had The Crafter’s Workshop Layered Stars Stencil (I may need to own that one!) and another friend got a brand new quote set from Dyan Reaveley, The Right Words, which I *needed* to use! 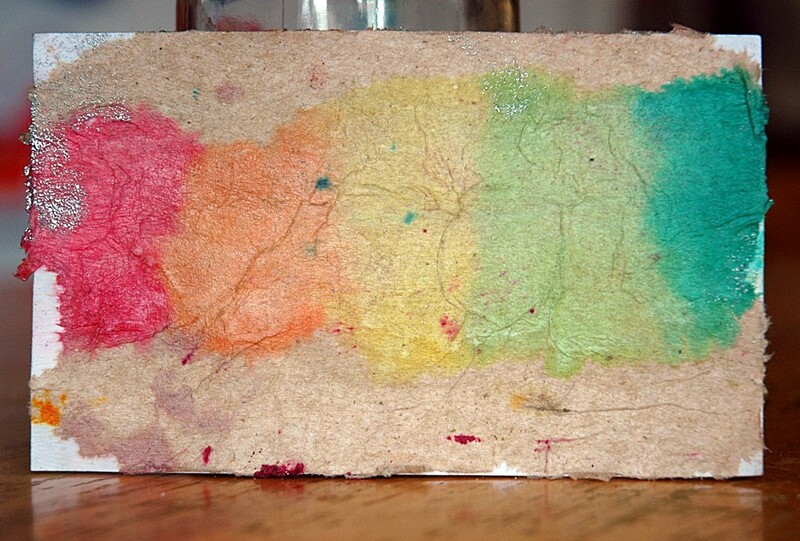 So I spread a layer of matte multimedium over the card and layered a couple of scraps of book paper I had left over from another (unfinished) project, which I sealed with more medium. Then I used the star stencil and light molding paste, which I heated so it would bubble and get that awesome velvety look and feel. I coloured the top star with Distress Markers and smeared them around to blend a little, then stamped some script over pieces of the card. 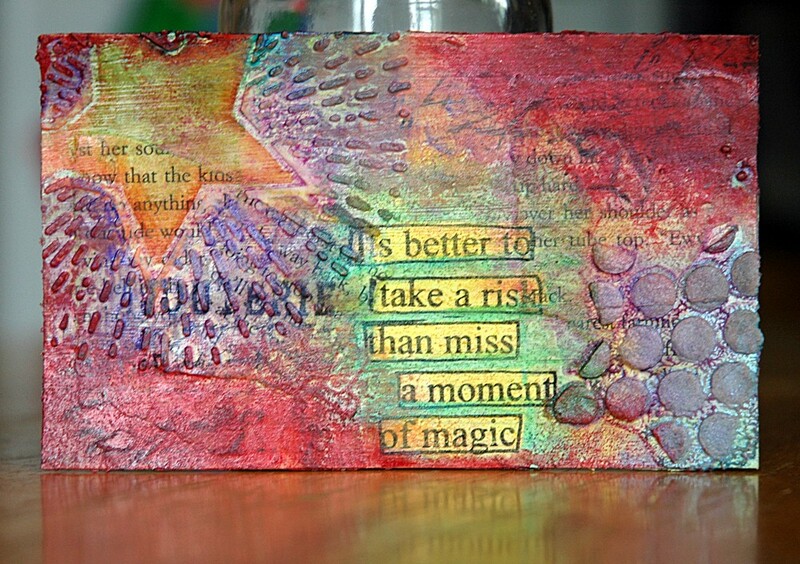 Finally, I stamped the quote, added a few mists of Dylusions Ink Spray and called it a night. Yesterday morning, M wanted to paint with “the shiny pots,” aka my Creative Imaginations Twinkling H2O’s so I added layers of those to the, so far, boring card. And now it’s all good! 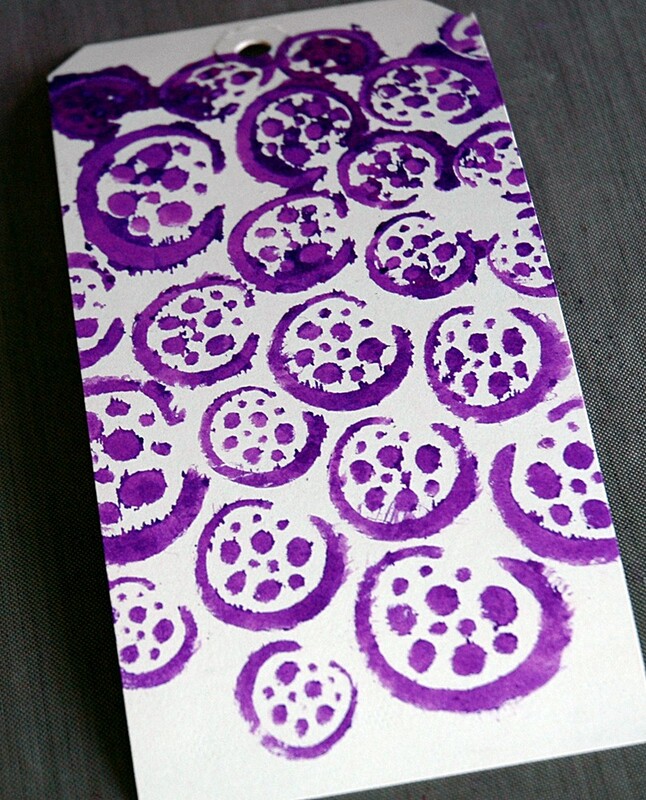 I did buy a couple of new stencils at crop night and I’m itching to make use of them. Plus, I bought some Golden heavy body acrylic paints to mix with my molding paste so I think I’ll have some fun with that combo tonight! Come back tomorrow and see how it all turns out! Two cards again today – you are lucky people! I used one of the prompts today, sort of! There was one that said to use coloured pencils on black gesso or paint. 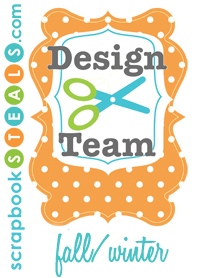 I’ve been meaning to break out my new colourful embossing powders form Stampin’ Up and use them on a dark background, and I’ve been meaning to try out a technique with stencils that Ali Edwards uses sometimes. This was day! 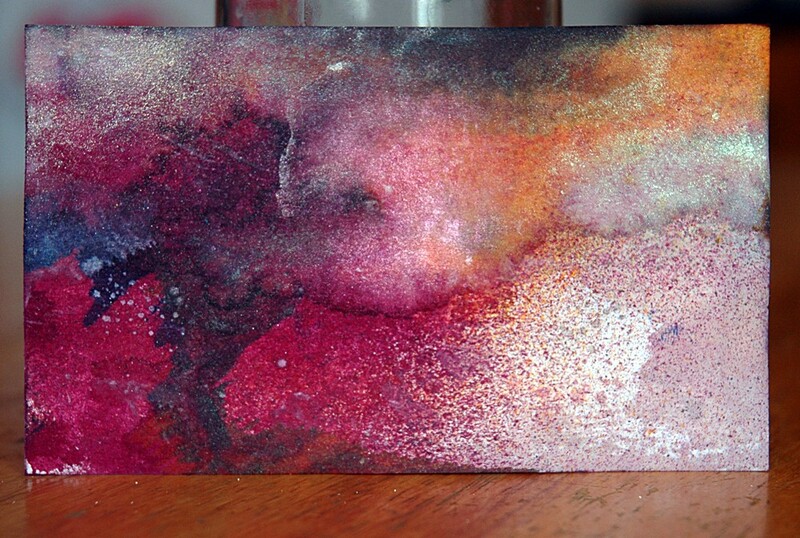 I painted my index card with black watercolour paints – it would have been acrylic but I don’t own black acrylic! 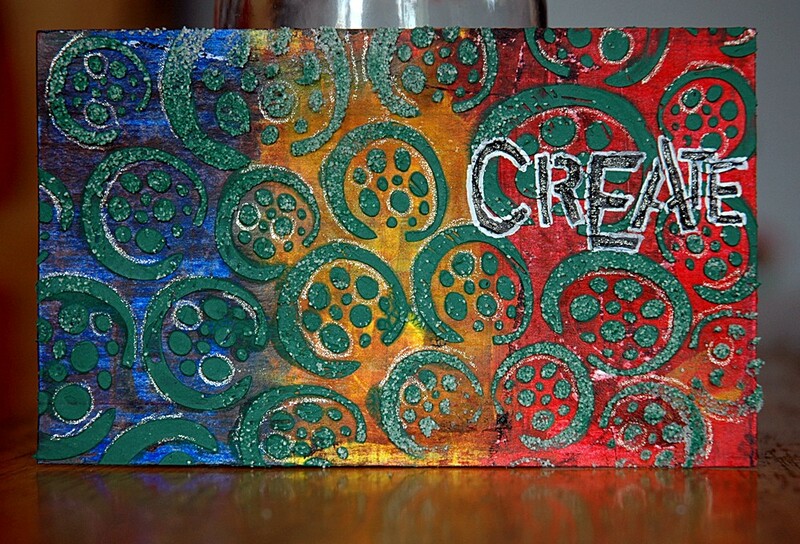 Then I paid down my 12×12 Punchinella stencil and pressed my Versamark pad over it. 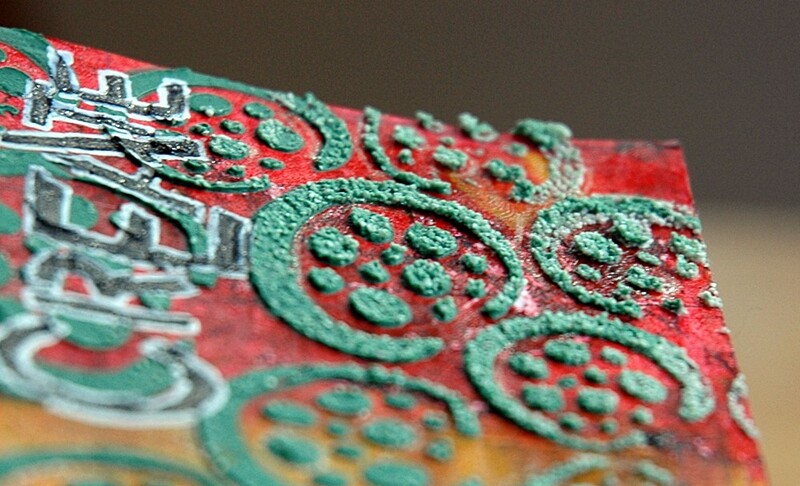 Once I removed the stencil, I sprinkled three different coloured embossing powders over it, and finished off the few open spots with silver. I love how it turned out, though in the future, I would use a lot less and be more careful of the silver since it went everywhere! The card has a lot more shine than I anticipated! 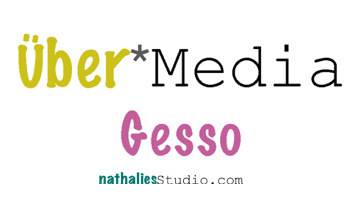 My only problem now was how to add my sentiment… More embossing, I guess! And then, since I was on an embossing roll, I embossed my wood veneer bird, I didn’t want it to feel left out, after all! See all that shine? In certain lights all you can see is silver! M decided to use the same technique as she watched the whole process with very big eyes! 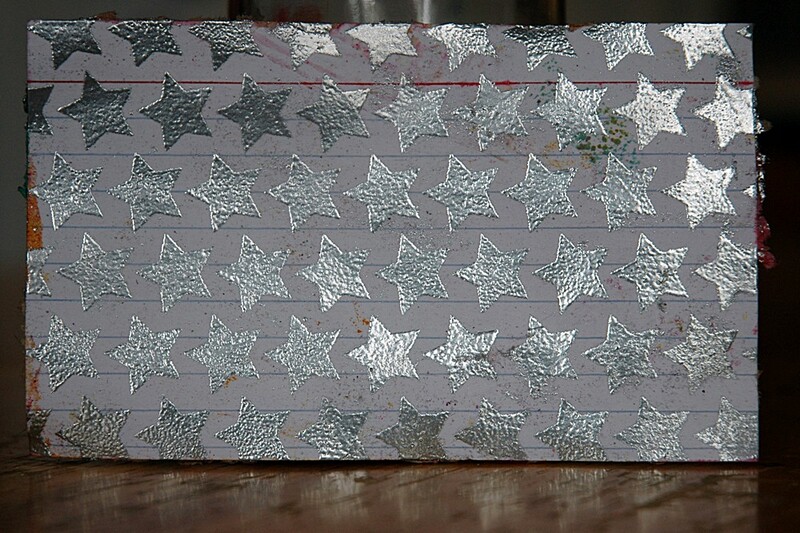 She chose the stars from Punchinella and wanted all silver, I guess she likes shimmer as much as her Mama does! 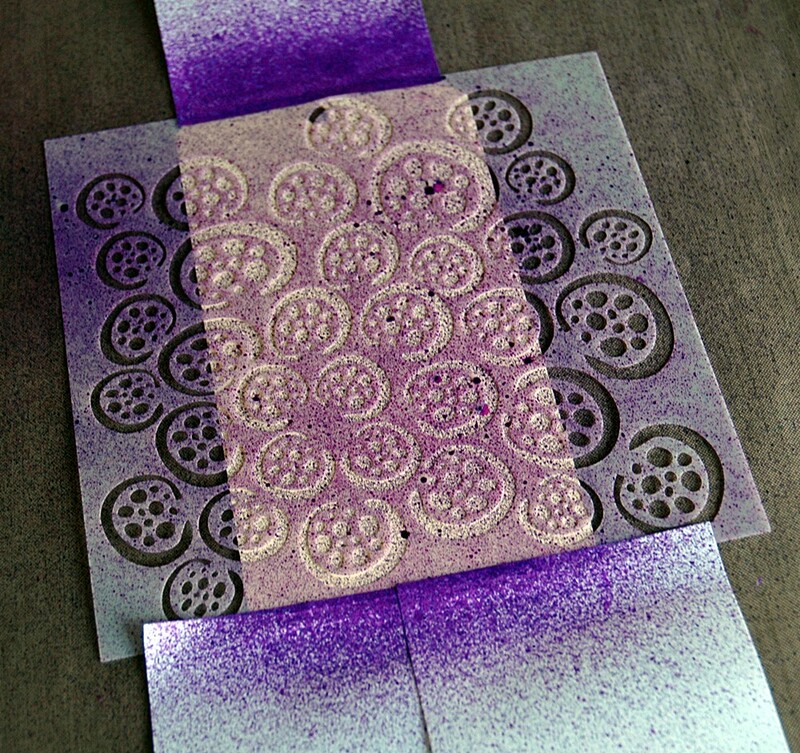 I held the stencil while she stamped the Versamark, then she sprinkled on the silver powder. After that there was a litle fight about who would heat up the powder. I won. 🙂 But she watched very closely. 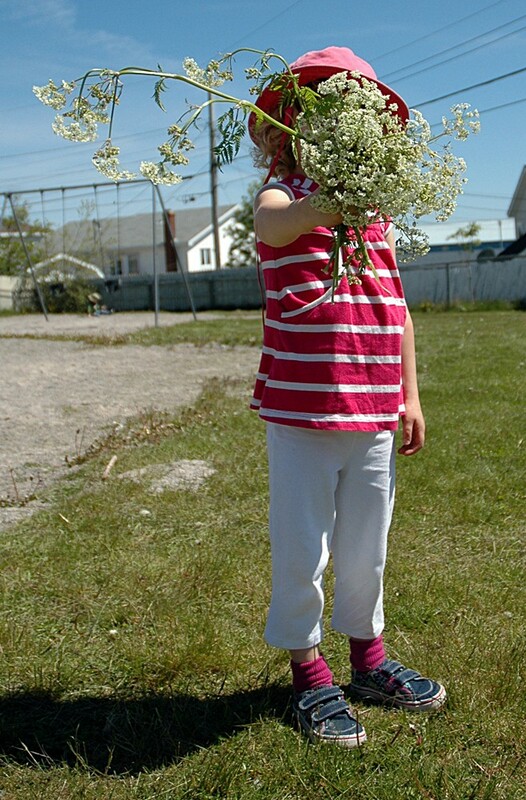 I love it, though it did take me an hour or more to convince her to let me photograph it. She decided that she didn’t like people looking at her things, hahaha! As you can tell, she caved eventually – I think hearing from Nana that she loves to look at M’s cards on the computer did it! M and I both made cards for yesterday but she was a little more specific about how she wanted hers to be than I was! I stamped script in Hero Arts Mid-Tone Shadow ink, then added some Tissue Tape. 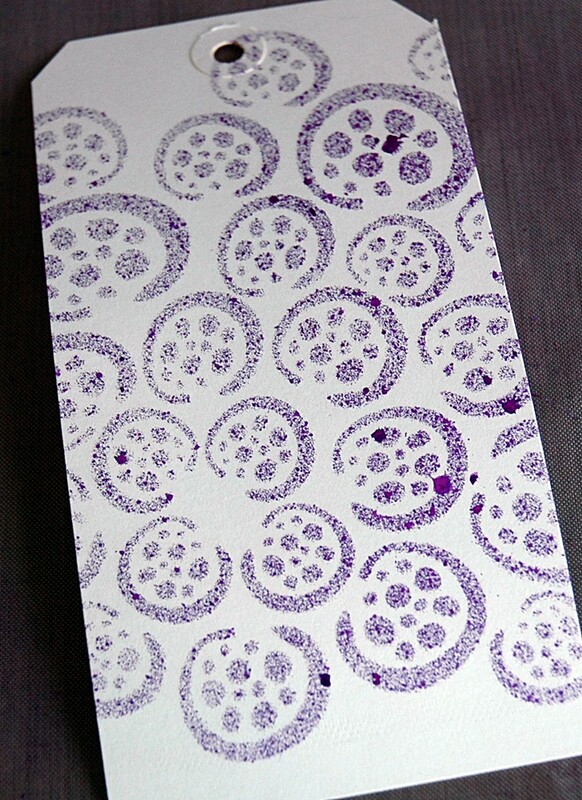 Over that I layered paper towel (of course!). This one happened to be covered in bright Dylusons Ink Sprays so I tore it up and just added the pieces I wanted, since there was a lot of open white space I didn’t need. 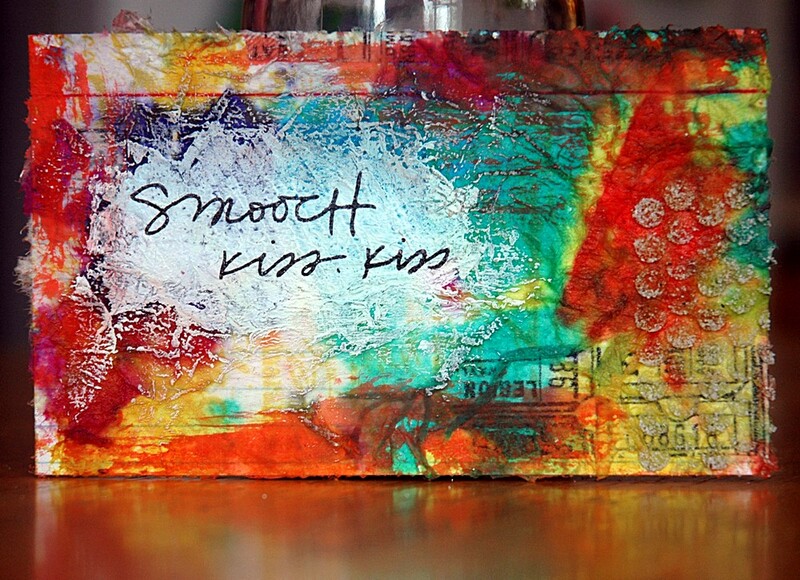 I really liked the look of the vibrant colours and didn’t want to mess with it too much so I simply smeared some white gesso over a patch, stamped my sentiment, and added some extra texture and dimension with a stencil and Coarse Pumice Gel. M did another beautiful watercolour but then wanted to mist over it. Since she has a hard time trying to push down on the mister (and I didn’t feel like D would appreciate hot pink and lime green on the ceiling) I helped her with that part. She picked the mists, put her finger on the nozzle, and pointed out the exact spot she wanted it to go (telling her mist doesn’t work that way fell on deaf ears), while I helped her push down and aimed the nozzle the right way. It was a combo of Dylusions, Colour Wash, and Perfect Pearls and I think it looks pretty cool – it has some awesome shimmer IRL! Back tomorrow with cards from both of us again! In the meantime, who’s going to crop night? I can’t wait – see you there! I taught a class on Distress Markers last night so when I got home and started to make my card, it only seemed natural to pull out the Distress Markers! 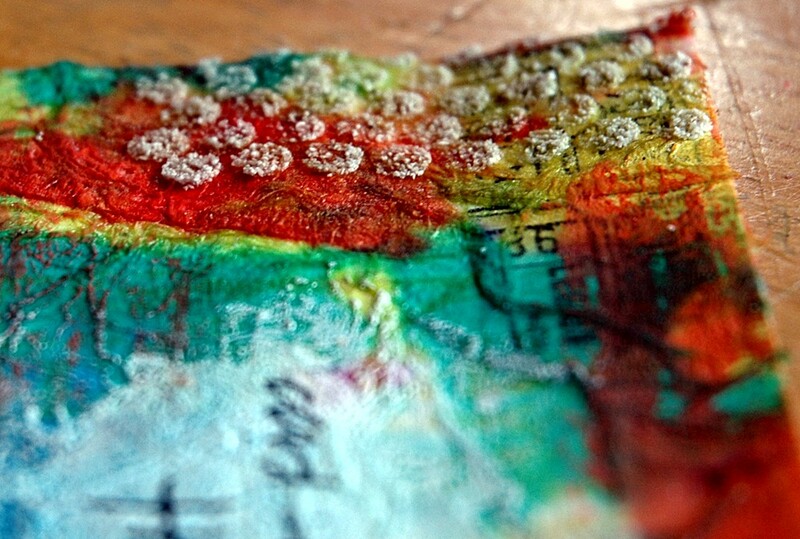 First, I scribbled a few reds and pinks on my craft mat and misted with water to make little puddles of colour. Then I dragged my card through the ink. I did a couple of layers like that but it was still pretty light due to the colours I was using so I misted the whole thing with Interference Red Perfect Pearls Mist.. 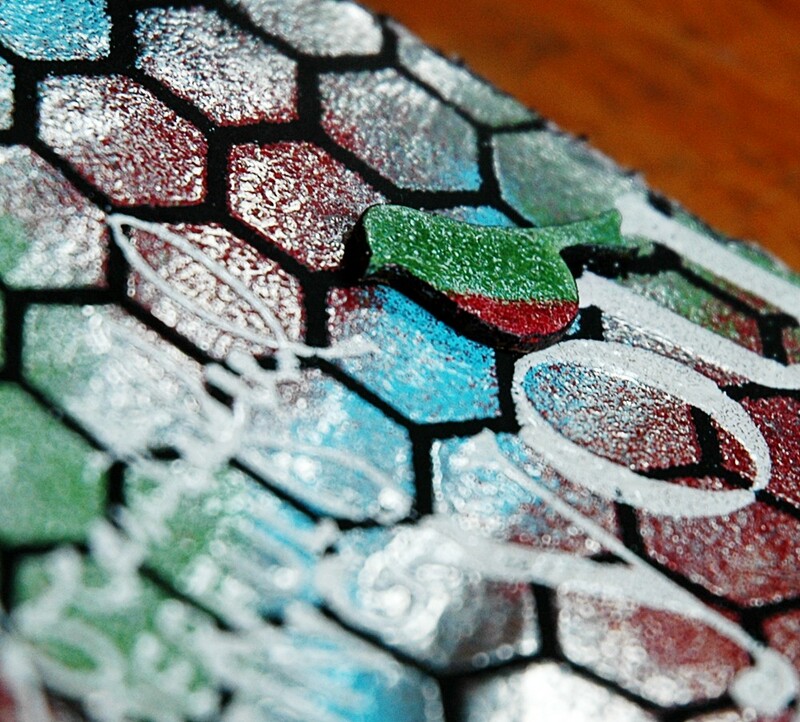 I stamped some leaves in VersaMark and heat embossed in white. I then quickly and messily coloured in the leaves with two colours of green. 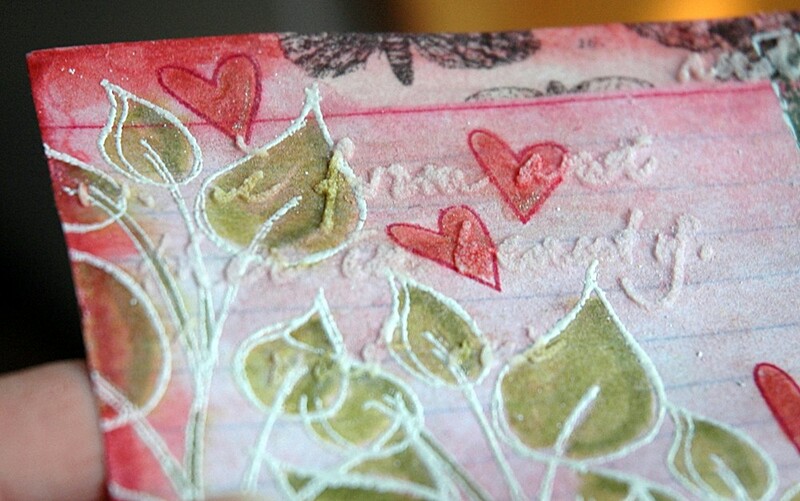 I stamped the sentiment in Archival, knowing I would be misting again, and stamped a few hearts, then added some tissue tape. 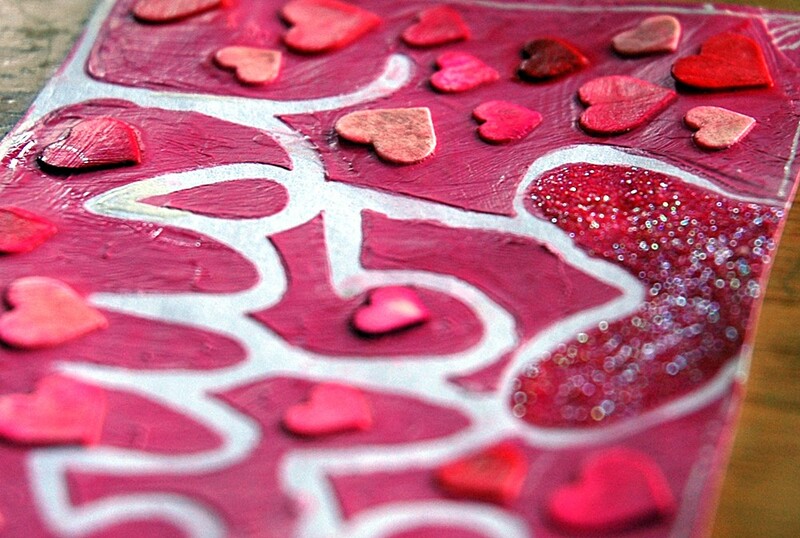 It still needed something so I used my VersaMarker to colour the hearts and then dusted them with Plum Perfect Pearls and added a few details with my Stardust pen and Uniball White Signo Gel Pen. 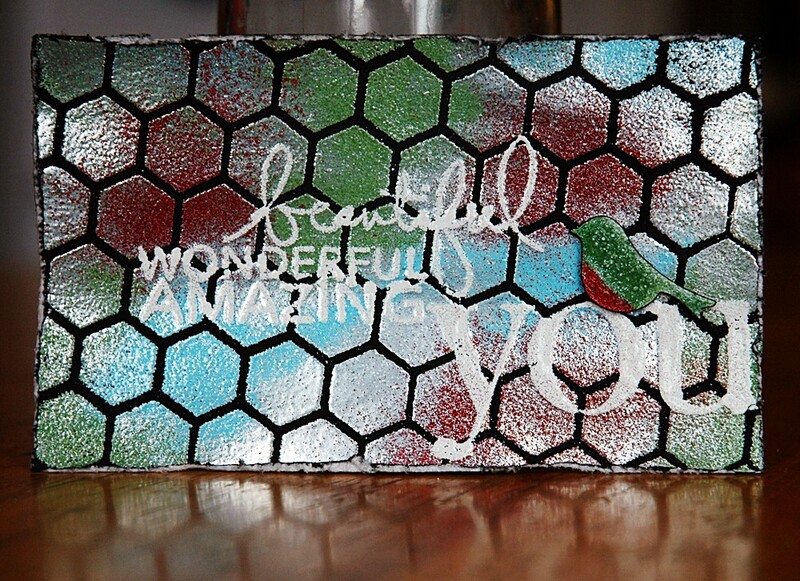 Finally, I misted the whole thing with Biscotti Perfect Pearls Mist and added Coarse Texture Gel over a script stencil. It’s OK, not my fave but it’s another card under my belt! I do like how the stencil work turned out – I was impressed to get the detail with a coarse gel, and I like how the white pen highlighted the words. The Stardust pen adds a good sparkle too, though you can’t see that in the pics. 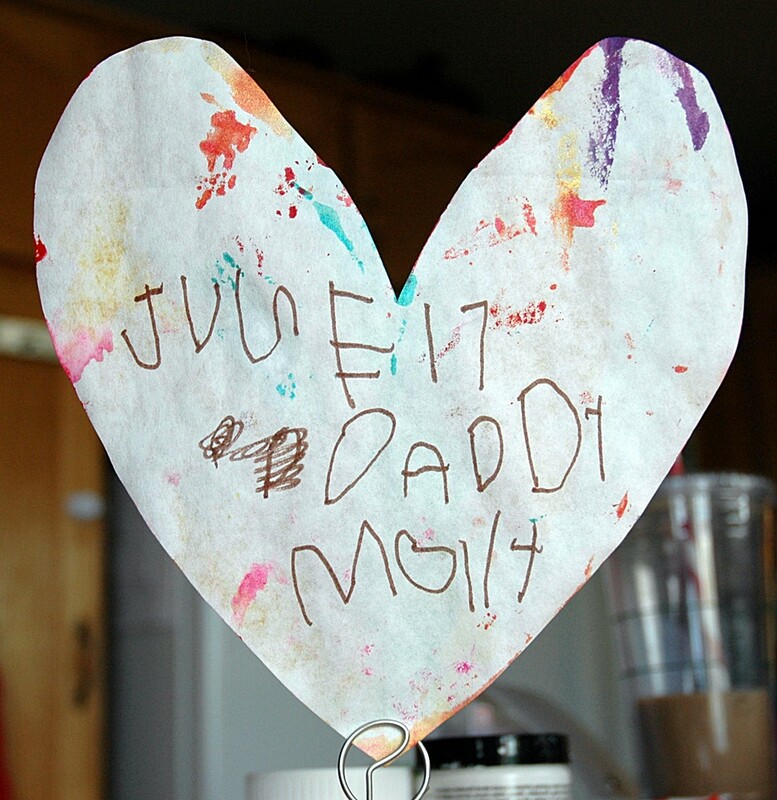 I’ll be back tomorrow with another card – and one from M too!